Are there any physical requirements for F-104 Flight Training? Yes – limitations are based on F-104 Aircraft Ejection Seat Specifications and Aircrew Flight Equipment maximum sizes. These represent the MAXIMUM ranges for flight qualification. Minimum ranges also apply. CANDIDATES MUST BE ABLE TO PHYSICALLY DEMONSTRATE A 35 – 40 LB / 15 – 18 KG PULL. When is F-104 flight training available? Training is available all year long, but must be scheduled in advance. US citizens should allow at least 30 days to complete the necessary pre-approval process. Non-US citizens should allow at least 60 days for application processing. It is sometimes possible to expedite the security clearance process, but training dates fill up quickly, so it is best to plan ahead. What is the flight training approval process? Training takes place at a United States Federal Government Facility and no one can enter without proper security clearance. iNFINITY SPACE assists student pilots with this process. You will be required to complete a form and provide personal information which can include your date of birth, place of residence, citizenship, social security number, passport information and place of employment. All applicants must also provide proof of a valid pilot’s license and current flight medical, and provide two forms of approved identification. Can I bring a guest with me to observe training? Guests are approved on a case-by-case basis and must obtain Kennedy Space Center security clearance. How high and fast will I fly during my F-104 training? The parameters of your training flight will be established during a pre-flight briefing with your instructor and are determined by flight conditions, training needs and FAA restrictions. 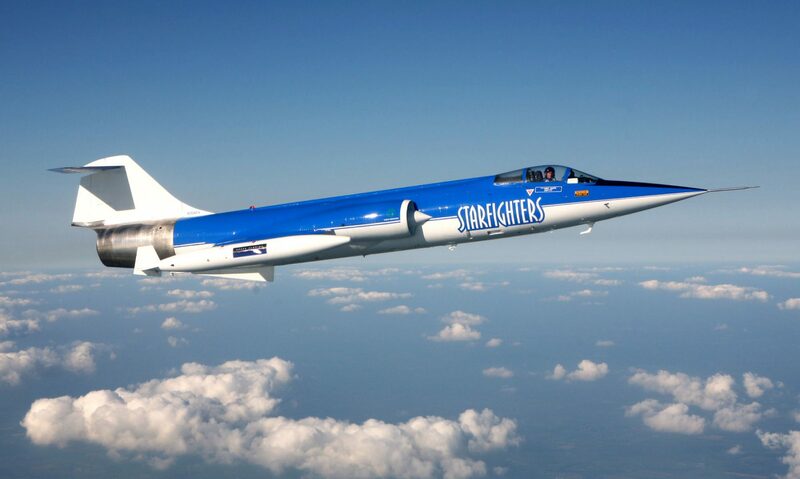 Most likely, you’ll conduct flight operations at around 36,000 feet and experience near-supersonic speeds. Can I take photos and video of my F-104 Flight Training? If you would like photos or video of your flight training, please inform iNFINITY SPACE. Personal cameras are prohibited within the F-104 training facility, but it may be possible to secure the services of an approved camera person. What is the location of the F-104 Flight Training? Training takes place at Kennedy Space Center on Florida’s Space Coast. F-104 Flight Training takes place on the grounds of NASA’s Shuttle Landing Facility (SLF), and within the restricted airspace above Florida’s Kennedy Space Center. This spaceport base of operations provides a multitude of unique features exclusively available to Starfighters Aerospace, and the qualified pilots specially authorized to complete Starfighter F-104 flight training. The SLF’s 15,000 x 300 foot runway is supported by its own air traffic control and radar facility, fire department, aviation safety and aircraft maintenance facility, and is situated beneath Restricted Airspace R-2934, which ranges from the surface to unlimited. This airspace allows Starfighters Aerospace aircraft to operate with zero general aviation or commercial aircraft incursions or delays.